Juvenile chubs and jacks make their home on a floating tree branch in the open ocean. Hawaii. Shortfin lionfish (Dendrochirus brachypterus), red variation, infront of a tin. Indonesia. Green sea turtle (Chelonia mydas) with a hook and leader hanging from its mouth off Oahu. Hawaii. Fibropapillomatosis cysts cover eyes of green sea turtle. A discarded lemon shark (Negaprion brevirostris) carcass in a marina. Bahamas. Red-footed booby rests on a wood palette floating in the open ocean. A shearwater rests on a platic cushion floating in the open ocean. Hawaii. A thriving artificial reef made from tied together concrete blocks off Bali, Indonesia. This fish trap contained racoon butterflyfish, bluefin trevally, brown surgeonfish, orangebar surgeonfish, manybar goatfish and blue goatfish. Most of these species are bycatch. The mesh size was only 1.5"x1.5". The fish will die from the pressure change when this trap is brought to the surface. Traps with larger mesh sizes would allow smaller, non-targeted species to escape eliminating unecessary mortality. Hawaii. A mangrove pod sprouts up amidst a dredging project on Cat Island, Bahamas. Komodo dragon (Varanus komodoensis) on a trashy pebble beach in Komodo National Park. Indonesia. I hate seeing dead sharks, especially juveniles. Sharks are top level predators in the ocean and maintain healthy populations of other fishes. Shark populations have been hammered worldwide, down 90% in just the past 3 decades. Most sharks can reproduce after 5-10 years but are often harvested much younger. These sharks are less than a year old. Tekka Seafood Market, Singapore. Head shot of a grey reef shark (Carcharhinus amblyrhynchos) with scarring and two rusty fish hooks in its mouth. Bahamas. I found this fish trap on a deep reef in the Bahamas. The trap contained 3 queen angels, 2 gray angels, 2 coney groupers, 1 Nassau grouper and 1 parrot fish. The angels and parrotfish are considered bycatch but will not survive the pressure change once the trap is brought to the surface. This trap was tied to a rope that ran square across the reef and was connected to more traps, about 60 feet apart. 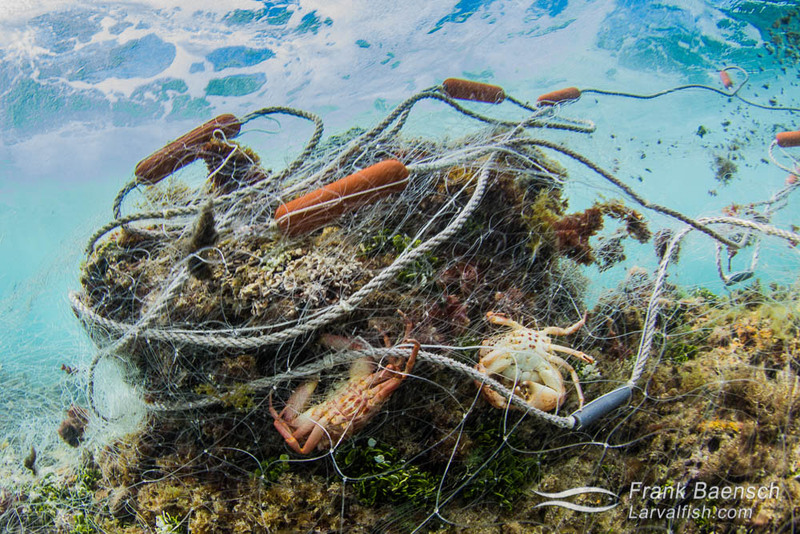 Trapping has severely depleted reef fish populations in the Bahamas. Dead juvenile sharks. Tekka Seafood Market, Singapore. Recently dynamited coral reef in Komodo National Park, Indonesia. Close up of a whitetip reef shark (Triaenodon obesus) with a fish hook in its mouth. Hawaii. Live frogs. Frog legs are delicacies in asian cuisine. Chinatown Seafood Market, Singapore. Schools of juvenile Pacific sergeants, Hawaiian chubs, amberjacks inhabit a fishing net floating offshore near Oahu. I also saw frogfishes, filefishes, triggerfishes, larval fish and a host of marine invertebrates (not depicted). A school of wahoo circled below. This is the most species-rich abandoned fishing net I’ve come across. Hawaii. A lone ace-eye hawkfish (Paracirrhrites aractus) on a bleached coral (Pocillopora meandrina). Hawaii's hard corals suffered severe bleaching in the fall of 2015 due to above average water temperatures. Luckily, this bleaching event did not have a lasting impact. Most of the corals, including this one, fully recovered within about 6 months. Hawaii. Butterflyfish picks on fibropapilloma tumor infecting green sea turtle. Hawaii. Most discarded tires have failed as artificial reefs causing more damage than good. However, in barren areas with high productivity settling larvae in search of a home will colonize even less than ideal substrate. This tire reef in a PNG harbor is thriving with life. Fishnet flotsum found in the the open ocean off Oahu, Hawaii. Trapped coral crabs in a 300 foot abandoned gill net on a reef in the surf zone on Oahu, Hawaii. The net also had trapped parrotfish, wrasses, goatfish, surgeonfish, spiny lobsters, slipper lobsters and other fish that had decayed beyond identification. An abandoned fish net on a beach in the Bahamas. A dead porcupinefish, likely caught with hook and line and discarded. Hawaii. Dead juvenile scalloped hammerhead sharks (Sphyrna lewini) washing up on the shore at a popular fishing spot on Oahu. The sharks had been caught with a hook and line and discarded. How people can waste the life of such beautiful animals is beyond me. Dead green sea turtle with fibropapillomatosis floating on the surface. Hawaii. Blue shark (Prionace glauca) with fishing leader. Rhode Island. Crown-of-thorns sea star (Acanthaster planci) feeding on a table coral (Acropora sp.) in Papua New Guniea. Trapped convict tang in abandoned gill net on a reef in Hawaii. The net also had trapped parrotfish, wrasses, goatfish, surgeonfish, coral crabs, spiny lobsters, slipper lobsters and other fish that had decayed beyond identification. Artificial reef (Hexadomes) off the northern coast of Bali. These hexadome artifical reef structures are part of a reef rehabiliation project off the north Bali coast. Built by local fisherman in Les Village, the structures provide a large surface area on which corals and other organisms can settle and grow. They form a three-dimensional landscape on the previously bare reef flat, and rapidly become refuges for large numbers of fish and other sea creatures. The domes will last for many years- long enough for the natural reef to become well established once more. The fishing groups in Penuktukan, Taman Sari and Yeh Biu have installed 22 hexadomes so far. These structures already give visitors the opportunity to observe more than 20 species of reef fishes. The hexadomes in these photos are about 2 years old. This is one of many rehabiliation projects organized by LINI (The Indonesian Nature Foundation). LINI (aka Yayasan Alam Indonesia Lestari) is an Indonesian based non-profit organization dedicated to conserving Indonesia’s coastal resources with primary emphasis on ornamental fisheries. Live frogs in Singapore's Chinatown fish market selling for about $2 each. Frog legs are delicacies in Asian cuisine. Fish collector in Hawaii with barrier catch net, hand nets and collecting bucket. Trapped goatfish in abandoned gill net on a Hawaiian reef. The net also had trapped parrotfish, wrasses, surgeonfish, coral crabs, spiny lobsters, slipper lobsters and other fish that had decayed beyond identification. A barred moray peeks out behind a pastic bag. Lembeh Strait, Indonesia. This green sea turtle has a fish hook and leader embeded in its flipper. Hawaii. A floating abadoned fish net in the open ocean. Hawaii. Aquarium fish collector in Hawaii. Aquarium fish collection in Indonesia and the Philippines often employs dynamite and cyanide which wrecks havoc on the coral habitat and the reef fish. Aquarium fish collection with nets as is done here in Hawaii has significantly lower impact and is sustainable when carefully excecuted and regulated. Hawaii. A juvenile blacklip butterflyfish (Chaetodon kleinii) makes its home in a tin can. Indonesia. Green sea turtle almost blinded by fibropapillomatosis swims by in blue water. Hawaii. Aquarium fish collector in Hawaii. Aquarium fish collectors in Indonesia and the Philippines often employ dynamite and cyanide which wrecks havoc on the coral habitat and the reef fish. Aquarium fish collection with nets, as is done here in Hawaii, has significantly lower impact and is sustainable when carefully excecuted and regulated. Trapped coral crab in a 300 foot abandoned gill net on a reef in the surf zone on Oahu, Hawaii. The net also had trapped parrotfish, wrasses, goatfish, surgeonfish, spiny lobsters, slipper lobsters and other fish that had decayed beyond identification. Green sea turtle with fibropapillomatosis in a cave. Hawaii. A juvenile octopus (Octopus sp.) hides in a plastic candy bag. Indonesia. Fish bones, plate and boot trash scene in Ambon harbor, Indonesia. These juvenile sharks are less than 3 months old. Tekka Seafood Market, Singapore. Close up of green sea turtle with a fish hook embeded in its eye. Hawaii. A pile of juvenile grey reef sharks for sale at Singapore's Tekka Market. Fish collector infront of a barrier net with a hand net full of flame wrasses (Cirrhilabrus jordani). Hawaii. Trapped crabs in an abandoned gill net on a Hawaiian reef. The net also had trapped parrotfish, wrasses, goatfish, surgeonfish, coral crabs, spiny lobsters, slipper lobsters and other fish that had decayed beyond identification.